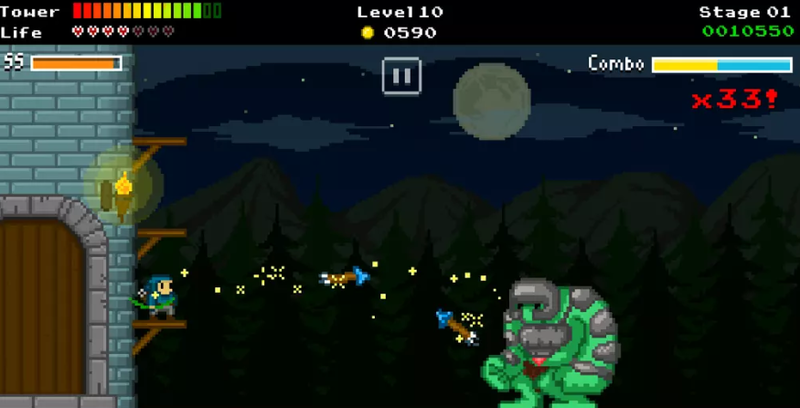 Warcher Defenders is a 2D arcade game for playing small archers who must defend the castle from monster attacks. Fortunately, your hero will be assisted by special characters who have many resources. By rubbing your fingers up and down, you can make the character climb up and down the castle barricade. To fire arrows, you only need to tap the screen. With this simple control, you must try to stop the enemy coming from the right side of the screen. You have to fight all kinds of enemies, such as bats, giant spiders, flying pumpkins, bones, and from time to time also have to face a very strong boss. In Warcher Defenders, you can play as three characters, but everything must be opened in the game. In addition, you can recruit mercenaries to help. And of course, you can also buy repairs for weapons that will provide a greater chance of surviving from the feared enemy boss.